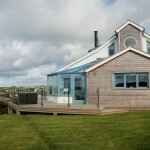 Architects at The Bazeley Partnership completed works on Trevista: a stunning 4-bedroom home in Tintagel, which faces out to the Atlantic Coast. The home was built to replace an existing bungalow that had fallen into a state of disrepair. 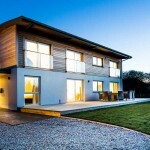 We were asked by our clients to create a modern dwelling that would fit into the character of the local area and take best advantage of its great location overlooking the Cornish coastline. The overall approach to the design was to take full advantage of the coastal views, as well as maximising the potential of the space within the site itself. The exterior is finished in traditional white render with a Cornish slate roof. Internally, there are many bespoke features including the custom-designed staircase and kitchen.